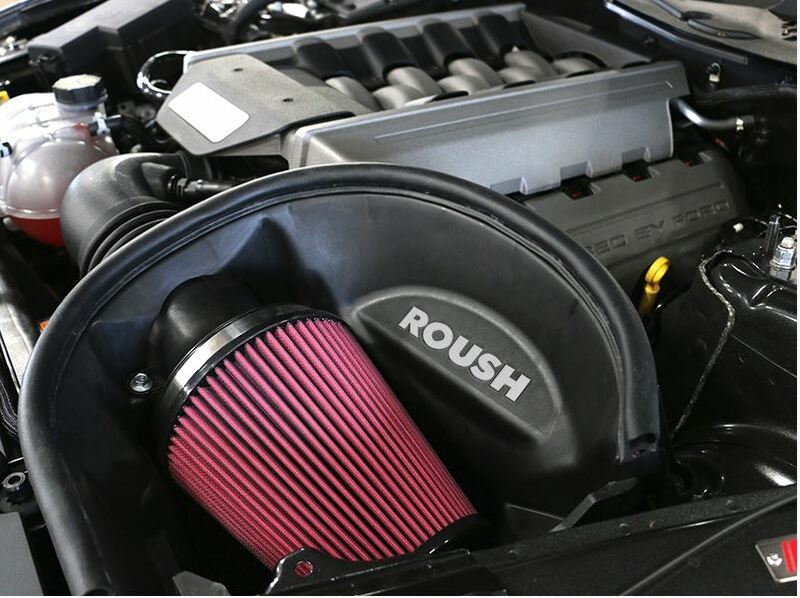 Install a more efficient air intake in your 2015-2017 Mustang with this cold air intake kit. Cold air induction allows for the potential of more power and fuel efficiency, instead of being restricted by the stock air box. At purchase, you can choose which engine you have so you can install the correct kit: 5.0L V8, 2.3L EcoBoost, or 3.7L V6. The V8 kit requires no calibration because of the 85mm MAF insert. For optimal performance and hood sealing, it was designed using the original CAD data. Since it's a straight bolt-on, you can possibly see gains of 10 HP and 8 foot pounds of torque. If you want to custom tune your PCM to get even more power, just remove the MAF insert for a 105mm bore MAF. This is not for sale or use in California and doesn't fit RoushCharged vehicles. Easy to install with no drilling or cutting required. The 2.3L EcoBoost kit also requires no calibration and replaces the restrictive air intake, and is designed to work with the stock 2.3L I4 engine. This kit feeds cooler, denser air to the turbo, increasing power output up to 29 RWHP and 27 foot pounds of RTWQ. This kit is 74% less restrictive than the stock at peak horsepower. The dry air filter is durable, will retain its shape, is reusable, and requires no oiling. This is legal in all 50 states. Easy to install with no drilling or cutting required. The 3.7L V6 is more efficient than the stock and unlocks power and fuel efficiency that would be restricted by the stock. No custom calibration is required and you'll get an increase of 10.5 HP & 9 foot pounds of torque. This high-flow system has 20% less intake restriction than stock. Legal in all 50 states. Easy to install with no drilling or cutting required and uses the factory mounting locations. Please use the drop-down menu above for your engine selection.